The month of July is flying by just as fast as June. Last weekend we visited my parents' for a full weekend: we checked out the animal barns at the Dodge County Fair (and may have had a treat or two before leaving), visited with my aunt and uncle from Florida, and celebrated my Uncle Lyle's 65th birthday! My Dad surprised us all with a table and chair for Charlotte. Charlotte has been using a foot stool and plastic tote as a place to color, so she is VERY excited to have a real table and chair just for her. Charlotte had a first last week that we aren't very excited about. For the first time she asked to watch TV - Elmo specifically. She was unbelievably clear and insistent and we complied through our shock. Here's Patrick and Charlotte watching Elmo. On Wednesday we headed up to the University of Minnesota's Biological Laboratory and Field Station in Itasca State Park. All first-year CBS Students attend a program called Nature of Life before starting college and as a staff member I got to bring my family up for one of the sessions. While I was learning about genetics, evolution, and bacteria Patrick and Charlotte explored the park. Above is Charlotte all ready to leave our cabin for the outdoors! We did find time to visit the headwaters of the Mississippi River together. Here I am coaxing Charlotte into the water. And here she is with her toes just barely in the water, checking out the view. She was perfectly happy going further into the water if Daddy held her. There appeared to be no way Charlotte was going to let go here...but she did eventually. Daddy and Charlotte relaxing on the rocks and investigating some rocks from lake bottom. And in case you didn't believe me, here's the proof of our location. Today we arrived back in the Twin Cities around noon and didn't waste much time getting to the splash park. This was Charlotte's second trip to the park and it went much better. She walked right up to the water and sat on the edge before bravely walking in up to her thighs. I think she most enjoys sitting and people watching. She is showing increasing interest in eating, but she just can't seem to figure out chewing and swallowing. Far too often her snack times result in gagging/throwing up. Her next appointment with the speech therapist will be in early August, and I hope she provides us with some additional guidance. Until then, we'll continue to enjoy the summer. We don't have air conditioning, so let's hope for 70-80 degree weather! This post is from me (Katie) logged in under Patrick's account. We haven't seen a doctor since our last post (yay! ), and tonight Charlotte weighed 22 lbs 4 oz. That's all for a medical-related update. See that teeny tiny spot of red mid way up the hill? 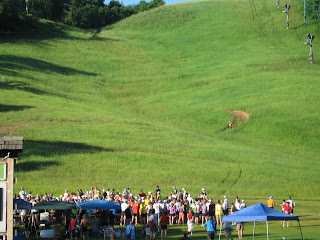 That's Patrick running the Afton 50k trail race on Saturday. 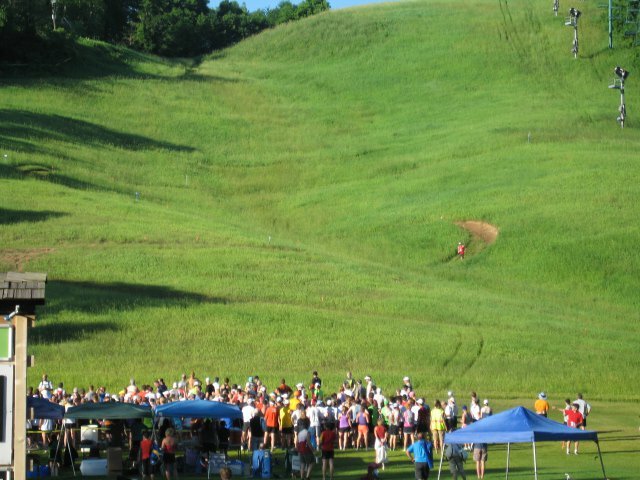 The race is traditionally run at Afton State Park, but was moved to Afton Alps due to the government shutdown (and associated state park closures). The course was very difficult. Patrick had trained on the original course and had thought he could run close to 3.5 hours. The back-up course brought unique challenges (running up and down the ski hill 4 times, for example), but he pulled through with a time of 4 hours and 30 minutes. After the race we had a nice lunch on the patio of Sail Away Cafe in Afton with Patrick's parents. Sunday we visited my parents. Charlotte has no interest in swimming pools, but she likes playing in the water while standing next to them. She ended up wearing a dry swimming suit most of the day. Charlotte enjoyed looking at Grandma's flowers as much as Grandma enjoyed showing her them. Surveying the backyard for dogs who attack with their tongues. Here's Charlotte successfully navigating the maze Grandma and Grandpa are growing for her. And now for the Fourth of July! Happy Fourth! We returned to Afton along with a few thousand others for the parade. Charlotte rode in style. The carrier allowed us to easily navigate the crowds and Charlotte was able to watch the parade over the heads in front of us. She got a flag and held onto it for most of the parade. We left the parade before it ended so that Charlotte could run and play at the park. Before long the parade crowd joined us on the playground and Charlotte had to figure out how to share the space.